TNA star EC3 made a surprise appearance at EVOLVE 61 event in NYC, and hit the ring during the Drew Galloway vs Johnny Gargano match. 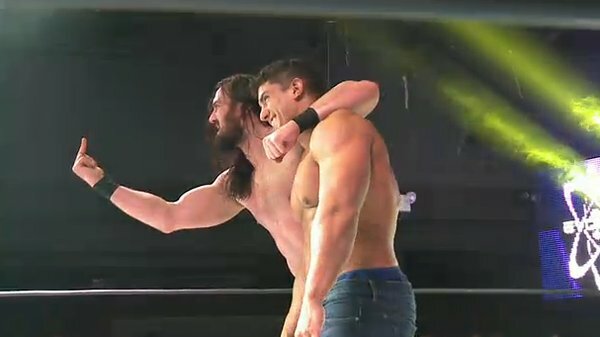 Things got interesting after the match as EC3 cut a promo in front of the live crowd and took shots at WWE, NXT, Bill DeMott and Triple H.
During his promo EC3 knocked NXT and said him and Drew Galloway are success stories despite the “machine” that is WWE. He added some shots about Bill DeMott and then said the King of Kings blew it in reference to Triple H letting him and Galloway go. Featured below is a full transcript of the promo, edited for clarity. EC3 and Galloway then fight off multiple referees and wrestlers trying to interfere, as EC3 continues his shoot, now addressing the talent that tried to chase him off. EC3 then emulates urinating on the Evolve turnbuckle and dropping an “EC2” on the canvas. Carter was of course referring to his time in WWE, where he actual competed in the original NXT concept when the program was a reality competition. Drew Gulak then rushes the ring and is met with the same fate as the others before him. It was at this point that Ethan Page rushed the ring with a steel chair and the Evolve talent was all able to run off the invading TNA force. The two sides had a staredown and traded promos for a bit before EC3 and Galloway ended up leaving. This entire angle was to set up a tag team match featuring Gargano and TJP taking on EC3 and Galloway at the next Evolve show on June 10th.